Come celebrate the lantern festival this Lunar New Year with us at the end of February! Seasons Place and STC Foundation will be hosting a Lunar New Year event featuring the renowned Asian a cappella and beatbox group VOX and their teacher Asian musical artist Lee Shou- Chuan! This amazing event is FREE to all participants and will have tasty rice balls, gaming booths, giveaways, brilliant dance performances, raffles, but best of all fun-filled memories! So don’t forget to save the date for this year’s Lunar New Year Celebration at Seasons Place on February 28th (Saturday) this year! With good food, entertainment, and friends, who wouldn’t want to come? 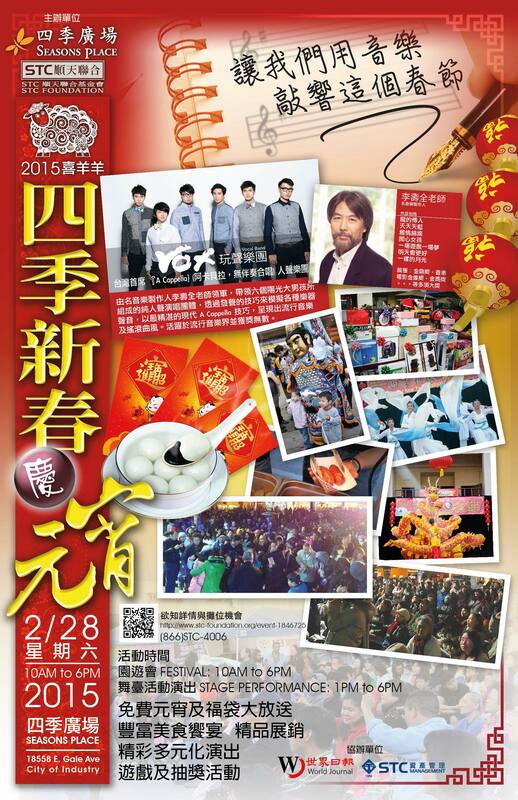 So come join us as we commemorate the year of the Sheep! Special guests, VOX are an A cappella and beatbox group that is well known and loved in Asia, and their teacher Li Shou Quan is a highly decorated music artist who has written many songs that are popular in Asia. A cappella is a musical style which specializes in singing without instrumental accompaniment and VOX hopes to bring you a marvelous show using their vocal techniques imitating a wide range of sounds to perform the latest in pop and rock music and bring forth the spirit of the Lunar New Year Festival! Not only the event is FREE! We will be providing free tasty rice balls! You will be getting fortune bags and plenty more from variety of booths. Come get it before it runs out! Lucky red envelopes and Spring Festival couplets will be given out to the audiences. Exciting raffle drawings will also be happening every half hour. You can use your receipt to exchange a raffle ticket if you spend $20 or more at any stores in Seasons Place, Rowland Heights Plaza, Yes Plaza, and Rowland Plazza. Valid receipt will be dated from 2/18 to 3/7. Past dated receipts cannot be exchanged. The more you buy, the more you will win! All are welcome to participate. Participators are discouraged from brining glass containers, laser pointers, fireworks or any other dangerous items. Violation of the rules and safety requirements set by the organization will have participant liable to being asked to leave at any time. Participants in the activities are to abide by the rules in the provisions and the organizer reserves the right to modify, terminate, or change the details of the event at its own discretion. Shuttle Bus Service will be provided. You can park your car at Yes Plaza, Rowland Plaza, or Rowland Ranch Plaza, and take a shuttle bus to Seasons Place.